^ Thompson, Prof Kenneth (2012-10-12). Readings from Emile Durkheim. Routledge. p. 148. ISBN 9781134951260. Retrieved 15 November 2017. Durkheim, Émile (1994). "Social facts". In Martin, Michael; McIntyre, Lee C. Readings in the Philosophy of Social Science. Boston, MA: MIT Press. pp. 433–440. ISBN 978-0-262-13296-1. Durkheim, Émile (2007). "The rules of sociological method (1895)". In Appelrouth, Scott; Edles, Laura Desfor. Classical and Contemporary Sociological Theory: Text and Readings. Thousand Oaks, CA: Pine Forge Press. pp. 95–102. ISBN 978-0-7619-2793-8. Jones, Robert Alun; Spiro, Rand J. (1995). "Contextualization, cognitive flexibility, and hypertext: the convergence of interpretive theory, cognitive psychology, and advanced information technologies". In Susan Leigh Star. The Cultures of Computing. Sociological Review Monographs. Wiley-Blackwell. ISBN 978-0-631-19282-4. Selvin, Hanan C. (1965). 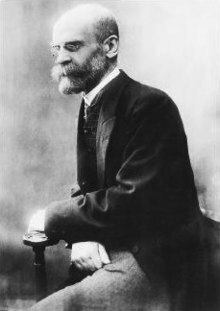 "Durkheim's Suicide: further thoughts on a methodological classic". In Robert A. Nisbet. Émile Durkheim. Englewood Cliffs, NJ: Prentice Hall. pp. 113–136. Osipova, Elena (1989). "Emile Durkheim's Sociology". In Igor Kon. A History of Classical Sociology. Translated by H. Campbell Creighton. Moscow: Progress Publishers. pp. 206–254. Archived from the original (DOC, DjVu) on May 14, 2011.